NOTE: The monster heals *1/2 the damage dealt. 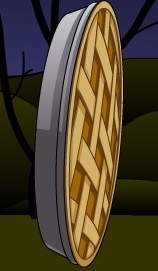 **Click to have your Floating Pie attempt to Paralyse foes! **Your Floating Pie will attempt to Paralyse your foe! *†Click to have your Floating Pie focus on damage! ††Your Floating Pie will focus on purely damaging your foe! *‡Your foe stuffs themselves too full of pie and is unable to move! ‡‡Your foe devours the pie pieces with no ill effects. This pie is so hot-to-trot that it is on the verge of flying away. Still, this companion can either scald for damage or overstuff your opponent to send them into a food coma. Numbers thanks to In Media Res and Kamui. Image, description and popups thanks to Syth. Normal Attack: Deals +5% damage as a mastercraft bonus. With two equally powerful hits, each hit does *1/2 damage. Paralyze Attack: With four equally powerful hits, each hit does *1/4 damage. MC: Deals +5% damage in Normal Attack mode (already shown above). In Paralysis mode, the MC is used to reduce the damage the monster heals. September 9, 2016: The pet was released.